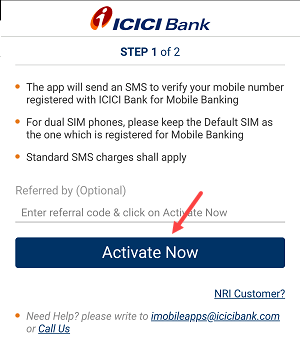 ICICI iMobile Application available for Android and iOS platform, you just need to install this application on your phone and complete one-time registration process. Before you start the registration process, please use your ICICI Bank account registered mobile number on your phone. The Application will send an SMS to verify your mobile number registered with your ICICI account. 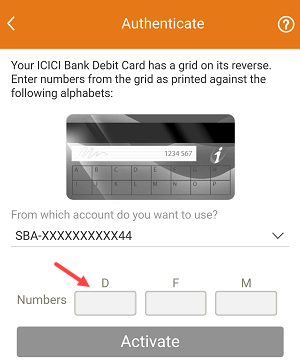 You can change or register your Mobile number at any ICICI ATM. Step 1: First install iMobile on your smartphone. iMobile available for Android, iOS, Windows Phone. Download and install it. Step 2: After installing, now open the iMobile. In the first screen you can see Activate Now, just tap on it. When you tap on Activate now, a verification message will be automatically sent from your registered mobile number, make sure you have at least Rs.2 balance. 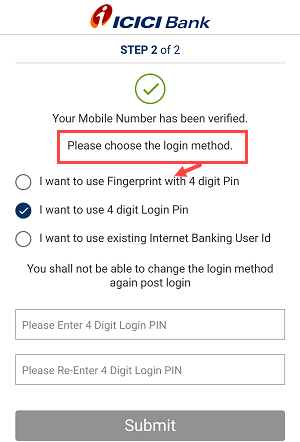 Step 3: After successful verification, next screen you have three option to login iMobile Application. You can select PIN and fingerprint login, 4-digit Pin login or use net banking login credentials. For faster login, select 4-digit Pin login option. Step 4: Now in the last step, you need to authenticate your account with Debit card grid numbers. Your ICICI Debit card has a grid number on its reverse. Enter numbers from the grid as printed against the following alphabets and tap on Activate. Done! your ICICI imobile banking activated successfully. Now you can log in using selected login option. 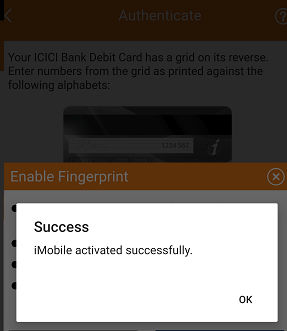 So this is the simple process to register first time with ICICI imobile application. If you are facing any issue while verifying your phone number make sure you are not registered with Pocket wallet Application. Just would like to ask you guys 2 questions regarding ICICI Bank’s iMobile app. 1. If I change my smartphone from Android to iPhone, can i able to use iMobile app again? Will previous’ devices ‘UNIQUE MOBILE DEVICE ID’ make any issue by using iMobile app on my new device? 2. Are all the feature of BHIM UPI on Android platform available in iOS platform too? 1. Yes you can use iMobile on iPhone too. Uninstall from Android and Install imobile on iphone and register. 2. Yes All feature of BHIM available on iOS too. Not BHIM UPI app… I mean BHIM@ICICI features of android available in iOS too? I mean all the features!!!! Not sure. Will reply you after checking on my iPhone. Thanks. Plz make a post on it. Waiting and bookmarked this page nd blog. Upi feature on iMobile for iphone is available. its available from last year onwards. Asked icici bank and confirmed. hi, iMobile app does not support iPad. It is compatible only with iPhone. Because it requires device id and registered mobile number. All iPads are not cellular capabilities. So beware of fake apps. I installed same application on ipad and it works fine. To login i just entered my net banking user id and password. It is compatible with ipad too. Once I fully complete the registration, and using it for one month,, and if i remove my registered sim card from the device one day, will iMobile app work as it was earlier? Yes it works without SIM. no. app only work with if registered sim is put on the phone’s sim socket only. Yes. iMobile send an SMS to verify mobile so SIM card requires for registration. Once you registered, you can remove sim card. Help me, I am not getting a page 5th authendicate ..
Hello, the same error i faced. I called customer care and found that my mobile number linked with pockets account. So contact ICICI customer care and raise your issue. They will link your mobile number.